Elizabeth Barrett-Anderson is Guam’s 4th elected Attorney General assuming office in 2014 for a term of four years. She is also a former Attorney General of Guam, a former Senator, and retired Superior Court of Guam Judge. Elizabeth graduated from the Academy of Our Lady of Guam in 1971. She received her undergraduate degree from the University of San Francisco in 1974, and her law degree from the University of Santa Clara School of Law in 1979. She is the first Chamorro female attorney to be admitted to practice law on Guam. She served as Legal Counsel to the Department of Education from 1981 to 1984, and entered private practice in 1984 with the law firm of Arriola & Cowan as an Associate. She was nominated in 1987 by former Governor Joseph F. Ada as the first female, and longest serving Attorney General of Guam from 1987-1994. She left her post as Attorney General in July 1994, and successfully ran for public office in the 23rd and 24th Guam Legislatures. In 1998, she was nominated by former Governor Carl T.C. Gutierrez and confirmed as a judge to the Superior Court of Guam. 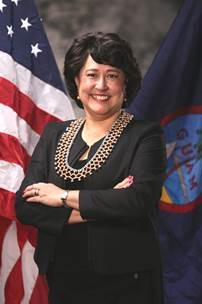 During General Barrett-Anderson’s judicial tenure, she was instrumental in the establishment of the Juvenile Drug Court in 2002, Guam’s first therapeutic court. She served on the Board of Directors for the National Association of Drug Court Professionals (2005-2007). She further established the Family Violence Court based on a “One-Judge One-Family” docket consolidating all domestic violence criminal cases and petitions for protective orders before a single judge to promote efficiency. She developed the DWI Court in 2012 streamlining the efficiency of drunk driving prosecution, and reduction in the number of drunk driving arrests on island. In its second year of operation, the DWI Court received the O’Rourke Award by the National Highway Traffic Safety Administration for its overall work in improving highway safety on Guam. General Barrett-Anderson retired from the bench in 2012 after 14 years as a trial court judge, and continued to work as a Senior Judge Pro Tempore where she developed the Judiciary’s Court Interpreter Registry Program responsible for registering courtroom interpreters in 18 foreign languages to provide equal access to justice through interpreter services for indigent defendants, and parents in juvenile and child support cases. General Barrett-Anderson is a dedicated public servant with over 35 years of government service to the people of Guam in all three branches of government.